Although I disagree with Wilders about Islam (I respect the religion but fight Islamists with all I have), we stand shoulder-to-shoulder against the lawsuit. I reject the criminalization of political differences, particularly attempts to thwart a grassroots political movement via the courts. Accordingly, the Middle East Forum's Legal Project has worked on Wilders' behalf, raising substantial funds for his defense and helping in other ways. We do so convinced of the paramount importance to talk freely in public during time of war about the nature of the enemy. It is clear that not everyone sees the danger. I quote a prominent American, who recently won a Nobel Prize: "Throughout history, Islam had demonstrated through words and deeds the possibilities of religious tolerance", and "Islam is not part of the problem in combating violent extremism, it is an important part of promoting peace", and "We celebrate a great religion, and its commitment to justice and progress". End of quote. I strongly have to disagree with this assessment. Islam has nothing in common with tolerance or peace or justice! President Obama also celebrated the fact that when the first Muslim-American was elected to Congress, he took the oath using the same Koran that one of the Founding Fathers - Thomas Jefferson - kept in his personal library. It is interesting to know that Thomas Jefferson in 1801 was about to wage war against the Islamic 'Barbary' states of Northern Africa to stop the pillaging of ships and enslavement of more than a million Christians. The ambassador of these Muslim nations told Thomas Jefferson and John Adams that Muslims find the justification for their slaughter and enslavement of kafir in the Koran. Now I ask you, dear friends, could it be that Thomas Jefferson did not keep a copy of the Koran because he admired Islam but because he wanted to understand the ruthless nature of his enemies? Ladies and gentlemen, I believe in democracy, I believe in the American people and the choices it makes, and normally, as a politician from Holland, I would never judge your President. But these remarks of President Obama, do not only affect America, but Europe too. I am afraid that President Obama's remarks could be a turning point in history. I fear that serious geo political changes are looming, changes that will alter our foreign policies, our view on free speech, changes that will alter the West, our way of life, and for the worse and not for the better. Ladies and gentlemen, there is one Western country that has been forced to fight the forces of jihad for its values since the very first day of its existence: Israel, the canary in the coal mine. Let me say a few words about that wonderful country. I had the privilege of living in Israel. However, in Europe being pro-Israel makes you an endangered species. Israel is a beacon of light in an area - the Middle East - that is pitch black everywhere else. Israel is a Western democracy, while Syria, Saudi Arabia, Iran and Egypt are medieval dictatorships. The so-called 'Middle East conflict' is not about land at all. It is a conflict about ideologies; a battle between Islam and freedom. It is not about some land in Gaza or in Judea and Samaria. It is about Jihad. To Islam the whole of Israel is occupied territory. They see Tel Aviv and Haifa as settlements too. I am very much in favor of a two-state solution. I mean Churchill's 1921 two-state solution, when Palestine was partitioned in a Jewish and an Arab part. Arab Palestine is now called Jordan, and therefore, there is already a Palestinian state. With eighty percent of the population having roots on the other side of the Jordan, there is no doubt Jordan is truly the state of Palestine. Islam forces Israel to fight, and Israel is not just fighting for itself. Israel is fighting for all of us, for the entire West. Just like those brave American soldiers who landed in Sicily in 1943 and stormed the Normandy beaches in 1944, young Israeli men and women are fighting for our freedom, our civilization. 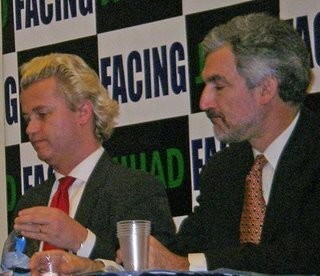 Hatemongers Geert Wilders and David Horowitz routed at Temple U. What on earth has gotten into Beck? Is he getting his talking points from Ibrahim Hooper? As Pamela Geller says, "Why would he stigmatize Wilders this way? Wilders is the embodiment of what our founding fathers extolled. Individual rights. Freedom of speech. Not sharia law." There is much more over at Atlas Shrugs -- read it all. Beck should have more sense. "But I will not let myself be reduced to silence." That's a bit too much conspiracy... Methinks Wilders is a man with his own agenda who is in an alliance of convenience with Likudniks. He wouldn't be anywhere with an Islamophobia platform would the Netherlands not have a large immigrant population from Muslim countries. Party for Freedom is not a political party with members, it's a one man's movement. Getting funded by the likes of Daniel Pipes, a foreign influence, makes my blood crawl. No transparency and openness. He never comes with a solution, has no party base in the Senate Chamber (Eerste Kamer) and therefore cannot become part of a coalition. (The opposition parties would have a majority and can block legislation) A populist voicing hatred, he should be unmasked by Dutch political leaders. (The Guardian) - Britain is to expel an Israeli diplomat over the use of forged UK passports by the killers of a senior Hamas official in January. The foreign secretary, David Miliband, will make a statement to the House of Commons this afternoon, blaming Israeli intelligence for the cloning of passports belonging to British citizens. The documents were carried by an assassination team that killed Mahmoud al-Mabhouh in a Dubai hotel. British officials said Miliband would "request" the immediate departure of an Israeli diplomat, adding that they expect the request to be honoured. "We think they mucked around with our passports, and we believe that requires consequences," an official said. Miliband will announce the results of an investigation by the Serious Organised Crime Agency (Soca) into the abuse of British passports in the assassination, which will implicate Israel. Diplomats stressed that the foreign secretary's remarks would be confined to the issue of passports and would not address Mabhouh's murder: "That is for the Emirati authorities," an official said. However, the statement will be widely seen around the world as the first definitive allegation from a western government of Israeli responsibility for the murder.